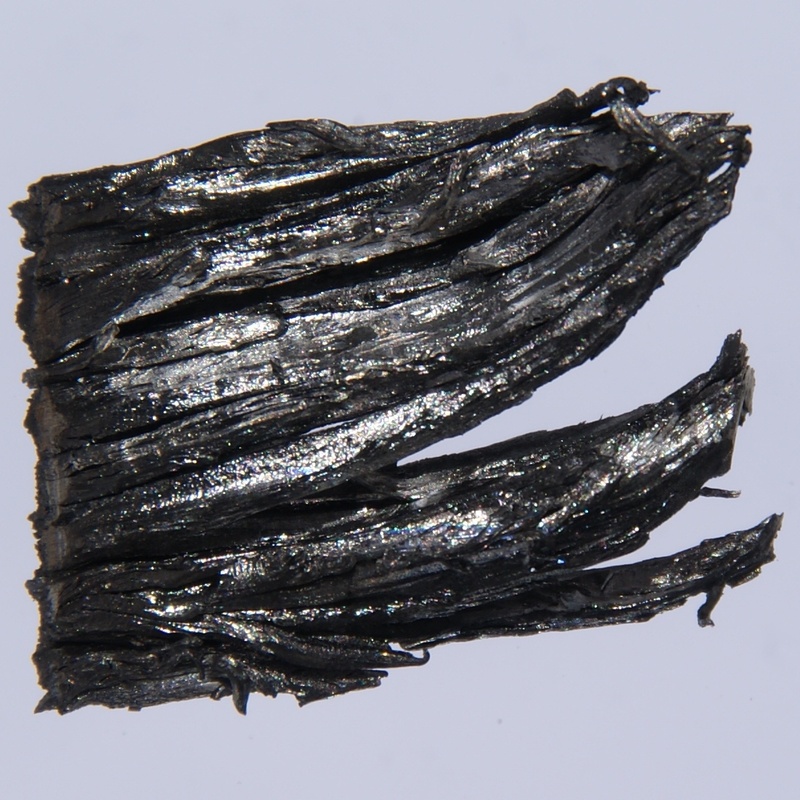 Dysprosium (pronunciation: dis-PROH-zee-em) is a silvery rare earth metal classified as a lanthanide and represented by the atomic symbol Dy [1, 2]. It is composed of seven naturally occurring isotopes, out of which 164Dy is the most naturally abundant (with 28% abundance) . Moreover, 29 radioactive isotopes have been produced, the most stable one being 154Dy, characterized by a half-life of 3 million years . 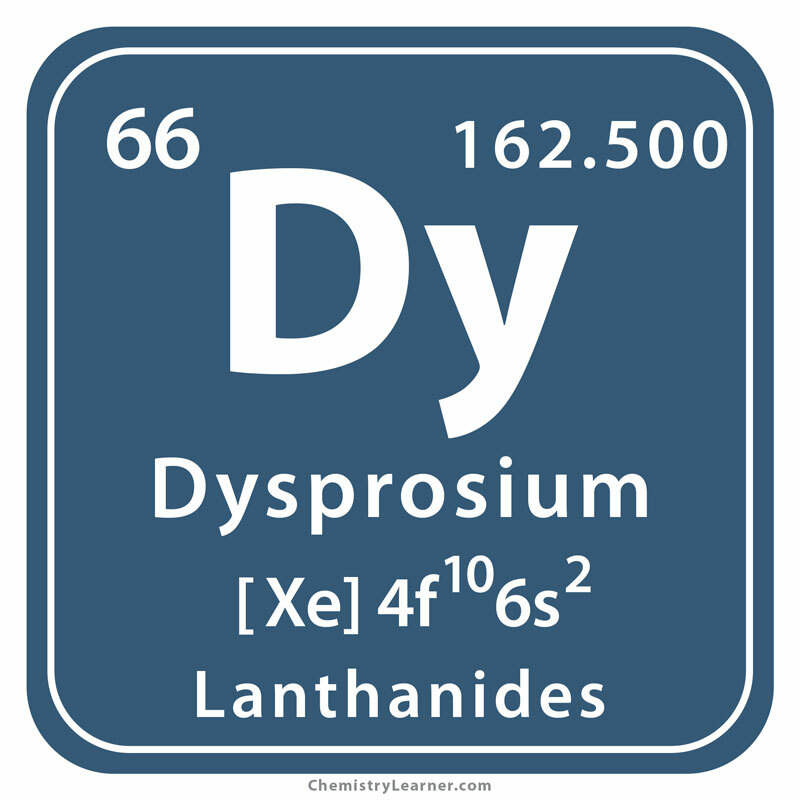 Dysprosium, like many other lanthanides, is extracted from the minerals bastnaesite and monazite, as well as from some other minerals like fergusonite and xenotime . It can be obtained from these minerals through the process of solvent extraction and ion exchange . It can as well be manufactured by reducing dysprosium trifluoride using calcium metal . The top 3 dysprosium reserve-holding nations are China, CIS Countries, and the USA whereas the top 3 dysprosium producers include China, Russia, and Malaysia . Origin of its Name: The name has been derived from the Greek word ‘dysprositos,’ which means hard to get . Who discovered it: The French chemist Paul-Emile Lecoq de Boisbaudran discovered Dysprosium [1, 4]. 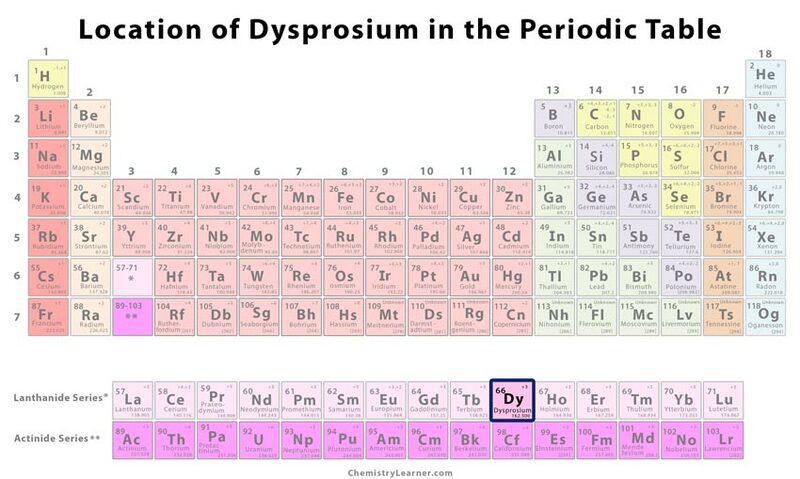 In 1886, the element dysprosium was discovered by de Boisbaudran who carried out a series of research on the compound yttrium oxide involving endless precipitations on a marble slab of the fireplace at his home in Paris . The compound was first produced in 1794, and since then several lanthanoids have been extracted, including erbium in 1843, holmium in 1878, and then dysprosium . In 1950, pure samples of the element were first isolated using the ion-exchange chromatography technique, which was developed by the Canadian-American chemist Frank Spedding and his co-workers at the Iowa State University . Today, that separation technique has been replaced by the liquid-liquid exchange technology . Dysprosium alloys are used for producing neodymium-based magnets because they have better resistance to demagnetization at elevated temperatures. Therefore, these magnets are used in generators, motors, electrical vehicles, and wind turbines . 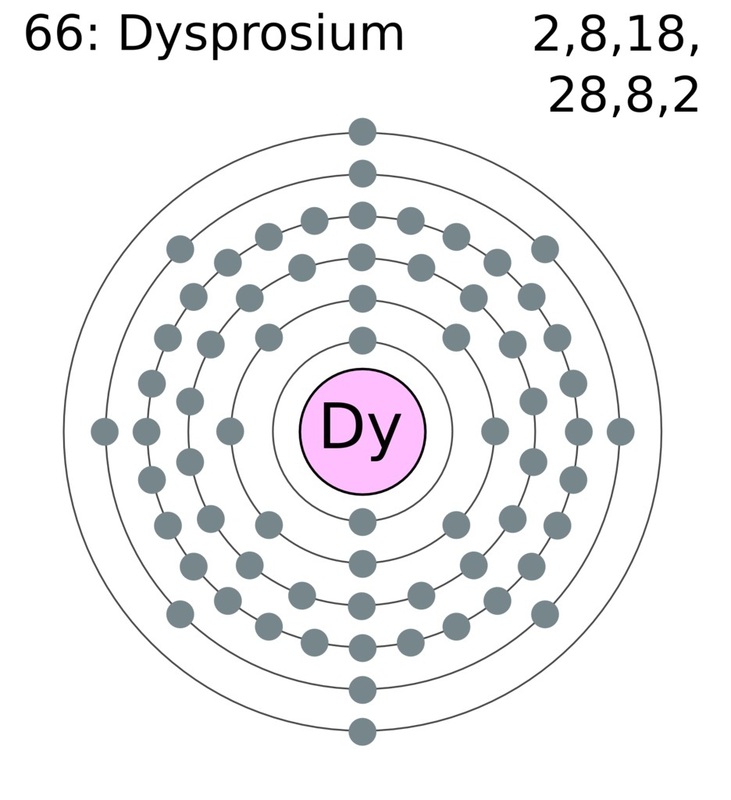 Compounds of dysprosium like dysprosium halide are applied in commercial lighting, including halide discharge lamps, helping in producing an intense white light . A mixture containing nickel and dysprosium oxide is utilized in making the control rods used in nuclear reactors to absorb neutrons for a long period without contracting or expanding . 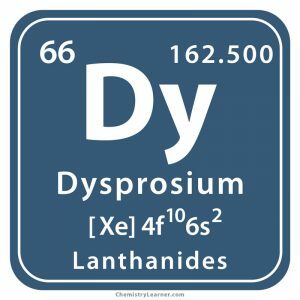 While soluble salts of dysprosium can be mildly toxic when ingested, animal studies have indicated that taking a very high amount of dysprosium (dose of 500 g) can be life-threatening for humans . Since Dysprosium does not have a hard texture, it can be easily cut with a knife . The element 66 has been visually depicted by an image of a nuclear reactor to reflect its use in the control rods of a nuclear reactor . 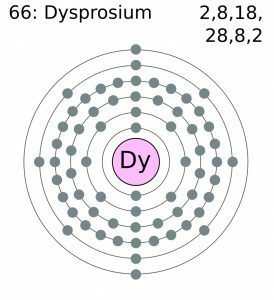 The pure form of Dysprosium costs about $450-$500 per 100g, but in bulk, it costs approximately $30-$40 per 100g .